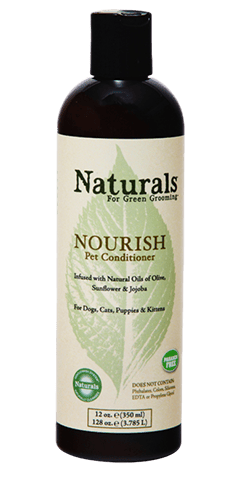 Since conditioners are left on the coat longer, providing more time for the absorbtion of its benefits, we enrich Nourish with moisturizing all natural honey, olive, jojoba and sunflower oil to deeply condition and give the coat a fuller, healthier look. pH Balanced. Cruelty Free, Biodegradable, and contains no Phosphates. 97% Natural. Dilutes 10:1. Ingredients: Purified Water, Cetearyl Alcohol, Glyceryl Stearate (compound of glycerin & stearic acid), Stearalkonium Chloride, Cetrimonium Chloride, Sunflower Oil, Honey, Olive Oil, Jojoba Oil, Lavender Oil and Proprietary Preservative System. Does Not Contain: Phthalates, Colors, Silicones, EDTA or Propylene Glycol.